Today, I'm linking up with Julie at Back to the Basics for her Five for Friday link party. I have always loved nesting dolls, but it seems now they are popping up everywhere. My best friend got me those nesting doll measuring cups for Christmas. Aren't they great? I have only one real nesting doll of my own. I found her at a flea market and she has no babies, just a lonely matrioshka. I'm pretty fond of her. And how about those YGG nesting dolls! They sold out in ONE day. But not before my mom snatched up a set for Jude. Amazon came to my rescue this week in a big way. The books I ordered from the school's book store were put on backorder (last minute, so thanks for that). I was able to get the text books I needed in time using Amazon Students FREE 2 day shipping. Hallelujah Amazon! Jeremy surprised me Wednesday with a brand spanking new iPad. It's mainly a going-back-to-school present, but I'm still clueless as to what else I should be using it for. If you have any good blog/design/writing/music apps to suggest, I'm all ears! I saw this movie last weekend and I have had the music in my head for 6 days straight. No joke. I bought the soundtrack because I just needed to hear it, hoping it would get it out of my head. I actually thought I could just listen to Anne Hathaway sing "I Dreamed a Dream" at my leisure. Ha. Cue the snot and tears as I'm driving. Still, I can't stop listening to it. If you haven't seen this movie yet, you need to. Everyone did such a remarkable job in this musical. 5. The ELEVEN link-ups for yesterday's book chat! Seriously, that was awesome. I love hosting the book chat whether 2 or 200 people link up. Seeing all of the new people as well as the return of some old friends...yesterday was a good day. If you have any topic ideas or want to co-host the book chat with me, please email or comment below. Next week's topic is self-help or inspirational books. Sounds like you had a pretty great week m'dear! And 11 link-ups?! That's amazing! The Book Chat is BACK :D... I'm excited for next week! PS I need a husband who buys me an iPad. THATS AWESOME. Les Mis was absolutely amazing!!! My husband even loved it. I am the same way with Les Mis! I have listened to only the soundtrack for 3 straight days now. I know, I couldn't stop listening to I Dreamed a Dream and crying my eyes out for DAYS after seeing that! SO GOOD! You will LOVE your iPad! I love playing Words with Friends, reading blogs in Reader, and just surfing the web! Thanks for linking up! I love my iPad! What a sweetie! I love Blogsy for blog writing and Notability for taking notes. Both are really easy to use but are paid apps. My favorite free ones are Paper and Evernote. I use them everyday. We are planning a trip to the movie theater soon...Les Mis is on the list to see!!! 1. YGG for reals?! Need. 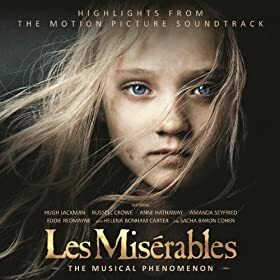 I keep seeing people saying how much they loved Les Mis and it makes me want to give it a try. I've never seen it and don't even know the story of it, but it doesn't seem to appeal to me very much? My mom asked me to go, maybe I'll take her up on it. Also, going to have to check out your book link up. Sounds interesting! Aw link ups seem so cool! I'm new to the whole blogging thing so I'm too sure how they work. Will you be having another one soon? Great blog by the way!